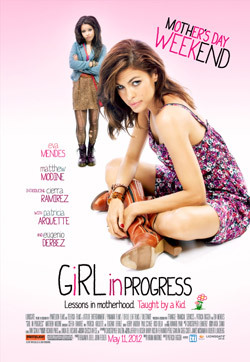 Trailer for Eva Mendes’ Girl in Progress. Eva Mendes, Cierra Ramirez and Eugenio Derbez star in the single parent dramedy. Watch the movie trailer for Girl in Progress below. As single mom Grace (Mendes) juggles work, bills, and her affair with a married doctor, her daughter, Ansiedad (Ramirez), plots a shortcut to adulthood after finding inspiration in the coming-of-age stories she’s reading for school. MPAA Rating: (PG-13) for mature thematic elements, sexual content including crude references, and drinking – all involving teens.